This private press issue from the Manchester underground takes Lee Hazlewood’s Cowboy in Sweden as its starting point. If this record isn’t the Whyte Horses trading under another name, I’ll eat my socks. 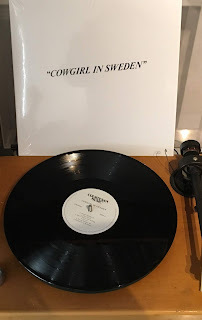 Cowboy in Sweden - saloon bar baroque, cavernous echo, cinematically psychedelic - was one of the major influences on the Whyte Horses’ debut, Pop Or Not. And so it is here, as the title obviously signposts. Only this is stripped back, without Pop or Not's orchestral flourish. At times, it suggests what Spector would sound like outside the Gold Star Studios and set up to record in a desert shack. There’s a cover version of the West Coast Pop Art Experimental Band’s Here’s Where You Belong - neat in itself, but raises the possibility that the whole album is a collection of obscure cover versions. They're that good. But really these are songs forged in the same febrile atmosphere as the first three Bee Gees albums, Susan Christie’s folk-psych and any number of soft pop nuggets. Only Don Thomas, unlike Lee Mavers, found a vintage mixing desk with original Sixties dust on it. Buy it before it starts trading hands for silly money.